What’s new about the updated AreaMax? We’ve developed a set of blog posts that we hope you will find to be a handy reference. There is so much to talk about! Let’s start with most noticeable change, the increase in lumens per watt from our more powerful light engine! Utilizing premium performance LEDs from leading vendors, the updated AreaMax leaps ahead of competitors in efficacy, achieving up to 160 lm/W, and over a 40% increase in light output over previous models. We’ve also added three new wattages to the product line: 30W, 80W and 100W. With the significant increase in lumen output, current customers can maintain their existing lighting program, but can choose to transition to lower wattage saving even more energy. Evluma recommends that current 40W customers purchase the 30W product, and current 70W customers purchase the new 55W model for comparative light output but for less watts, but ultimately the choice is yours – and you have lots of them! Uniformity is desirable because it creates an evenly illuminated surface and reduces the contrast between areas that are high vs. low lit. A quick look at the Isofootcandle Lines of Horizontal Illuminance on updated models reveals a slightly wider coverage at 0.5, 0.2 and 0.1 footcandles leading to a more uniform distribution of light on the ground. 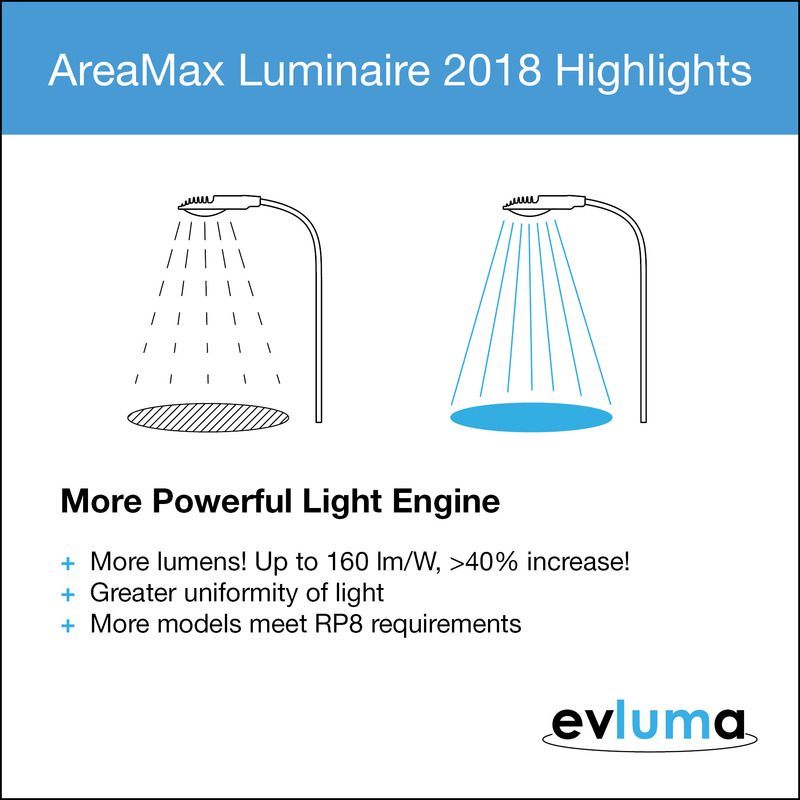 The AreaMax has always been known for it’s attractive, diffuse light, but now it is more uniform than ever before thanks to a more powerful light engine. RP8 is a recommend practice for designing new continuous lighting systems for roadways and streets. This design criteria specifies recommended vales in footcandles for various roadway designations: local, collector, major and expressway, also taking into consideration pavement classifications. For a quick reference table click here. With the increase in lumens even our lowest wattage AreaMax can be spaced effectively to meet certain RP8 roadway designation. Higher wattages may be recommended when replacing legacy HID roadway lights as the pole space may be pre-determined. IES files are available on the AreaMax Photometrics page.